The Effect of Computer Games Structure on Subjective Perception of Time : MU Game Studies, z.s. Computer games are often associated with the “time loss” phenomenon and so with the distorted perception of the passage of time during gameplay. Existing studies of the perception of time are frequently comparing different media between each other or the research is focused on the time distortion during gameplay in general. But the structure of the game was never considered, nor if different games, their segments or direct individual game actions distort our subconscious about time, more than the others. Thus in the proposed research regarding the nature of “time loss” phenomenon we applied adjusted method of produced time estimates in the prospective paradigm. The experiment was conducted on three structurally different computer games (from the time frame view, valence, genre and control style). Through the multivariate regression analysis was then possible to define individual game actions that were connected with the “time loss”. Primarily it was those, which were associated with high cognitive load and absence of strong tension or arousal. Computer games as a medium are exceptional in the fundamental level of their interactivity. Unlike the movies, playing games isn’t just perceptive activity, but requires constant inpust from the player. As noted by Espen Aarseth (1997), computer games are not a story themselves, but rather a machine for production of stories. The game challenges us, gradually reveals its contents to us and based on our actions and decisions, constructs adequate narration. It almost constantly requires our attention and activity. The attractiveness of the medium largely lies in the interactivity that can immerse us into the fictional environment of games. In modern complex games, from such series as The Elder Scrolls, Assassin’s Creed or Grand Theft Auto, with spatially extensive game worlds and an elaborate system of episodic objectives, you can spend a few tens to hundreds of hours in real-time, before the player uncovers at least the most of the content. It can also happen, that we spend that amount of time with graphically and content wise simpler games, which has a gaming system, that will hold us for a long time in a “flow” state (Csíkszentmihályi, 2008). In this state we’re fully focused on playing games, which challenges us, that are not trivial for us (we would get bored with those) nor unbeatable (those we would give up). Digital games have by their technological nature basically wide repertoire of tools to modify the course of the game in a way so the player stays in the “flow” state as long as possible (Chou, Ting, 2003; Wood, Griffiths & Parke, 2007). As with different fun leisure time activities, when immersed in the game reality, we stop to perceive the reality around us. This phenomenon, in science and so in gaming discourse called “time loss”, is often reported among players (Wood, Griffiths & Parke, 2007; Myers, 1992). The distortion of subjective time may continue even after playing (Luthman et al., 2009). However, studies examining this issue are usually based on similar research design, which allows to analyze the perception of time within the gameplay as a whole (Sanders, Cairns, 2010; Tobin, Bisson, Grondin, 2010; Tobin Grondin, 2009; Gruber, Block, 2005; Rau, Peng & Yang, 2006). They don’t focus on a specific segments or actions in a game, that may stay behind the distortion of time perception effect. It often does not take into account, which games were selected for the experiment (and their characteristics) or which have been, in the subject of the experiment, played out of his/her own will and in what order. The legitimate objection is that very specifics of the game might significantly influence the measurement and that therefore games might differ between each other in the matter of the distortion of time perception effect. Verification or refusal of such hypothesis is relevant as for the media science, psychology and methodology. Exploring the subjective perception of time, depending on the specifics of the game is complicated because the same fixed progress in the game isn’t always played. Therefore it isn‘t easy to determine the specific process of the game and apply a measurement to this subject. Even in games with linear story we can‘t for instance say that in the 20th minute, the game will evoke tension, fear, or vice versa it‘ll bore the viewers. You can always stop, choose a different game tactics, you can lose or retrieve saved position, etc. Computer games in essence operate with multiple timeframes simultaneously. Juul (2004, 2005) defines the play time and the fictive time. While the play time is the objective play time, the fictive time is characterized by change of the game state. We can also distinguish two ways of interaction of these time frames. The first way is a real-time interaction (Juul, 2004), where the player inputs are immediately reflected in the game environment. The second way is turn-based interaction. This means that the player acts first, and then the events in the game occur, on which the player reacts. Loading, saving and the cut-scenes Juul identifies as a specific disturbances of these two time-frames (Juul, 2004). Thus a possibility to determine a specific “time-line” showing in what way the game state changes (i.e. what happens in the game against the external time), whether there are some disturbances of the time frames and how the player reacts to the game state changes (what are we doing in the game). In 2012 an experiment was realized. Its goal was to determine whether it is possible to identify individual game elements and actions or general structural differences in games at which there is significantly more distorted perception of real time. Experiment involved 11 subjects in age from 21 to 26, nine men and two women. Two hypotheses have been set. The first hypothesis focuses on the differences in perception between the tested games. The second hypothesis focuses on the differences in the perception of gaming activities in each game. These games were chosen for the experiment: Mafia (2002), Fallout 2 (1998) and Machinarium (2009). Mafia represents real-time action games with a vast fictional world in which a linear story is situated. Game controls are standard for this type of games, but also is one of the more difficult, requiring a certain cognitive skill (Kirkpatrick, 2009, Brown & Cairns, 2004). The mission “Clarks motel” was chosen for the experiment, it contains two parts – action part with shooting and cut-scenes, and car chase part with driving a car. In Fallout 2 (1998) the player can’t operate the camera angle. The game is controlled only by mouse (lower cognitive-load) through extensive interface. Tactic is important during the fights, but also during inventory management and dialogues with NPCs. This game combines real-time and turn-based interaction between time frames. The starting linear sequence “Temple of Trials” was chosen for the experiment. Pre-prepared position was adjusted, so that during the experiment would the character level increase. 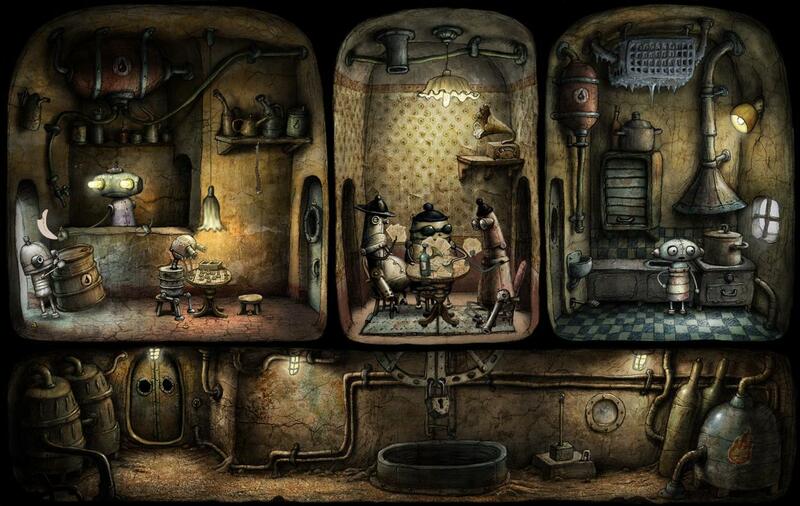 The last game is the Czech animated point-and-click adventure Machinarium (2009). The game with simple interface is controlled only by mouse. It also includes integrated help and numerous minigames and puzzles. The game requires a lot of attention to solve each problem, and finding the right sequence of actions. It features real-time interaction, although there are frequent moments when we have to wait for animations to change the game state. For the experiment was chosen the starting sequence. Machinarium, compared to the previous two games, is characterized by its positive valence of content. The observed actions for all three games are listed in the chart no.1. As can be seen, the selected games differentiate in interactions of their time frames, control method, the complexity of the game interface, different valence of content and in specific disturbances in the time lines of the game (non-interactive sequences, re-play after loss, additional minigames, etc.). These differences will be interpreted in the discussion using the theory of the AGM model (see below), which operates on the attention, arousal and valence level. ›› The first hypothesis therefore assumes differences of time estimates between the tested games. ›› The second hypothesis claims that we can find gameplay activities or game elements, which have significant impact on time estimates bias. There are four most widely used methods for research of subjective time (Zakay & Block, 1997, Siegman, 1962, Lorraine, 1979). In the verbal estimation method the subject is asked to verbally express the elapsed time of the experiment. When using the method of production, the subject through activity creates the time period which is defined by the researcher. When using method of reproduction the researcher defines the time by a specific activity and subject is to repeat this period of time either by the same or a different activity. The last method is a method of comparison, in which the respondent compares different intervals. Regardless of the method used, we must also choose between two paradigms. Prospective, in which the subject is informed before the experiment that he/she will have to estimate the time, and retrospective, where the subject estimates the time after the end of the experiment, without knowing in advance about this task and enter into such an experiment unaffected (Zakay, Block, 2004). In order to analyze the influence of individual gameplay activities on the subjective perception of time, it was necessary to repeat the measuring in short time periods during the game and also assign the occurrence of all gaming activities and elements for each measuring interval. So during playing a computer game it was always required to estimate the time period 15 times, the estimate meant the beginning of the next time interval. Because each of the individual time intervals were directly connected, it wasn’t possible to choose the reproduction method (there wouldn‘t be time to reproduce the interval). Also methods of comparison wouldn’t be effective because of the number of intervals. Due to the number of estimates it was necessary to use prospective paradigm and the production method. This method also has the highest degree of reliability (Siegman 1962). The subject was thus instructed before the experiment, that except for the non temporal task (playing games), he/she will be required to estimate the elapsed play time. One minute interval was arbitrarily chosen as an adequate time period. Once the subject gave the researcher the designated sign that according to him the one minute elapsed, the real length of this interval was read from the stopwatch, while another measuring interval by this signal began. 15 intervals were measured in this way for each of the three observed games (so together N=495). The researcher stood behind the subject, so that he won’t intervene into the research, but also that he saw what was going on the screen. Then based on the observations he would assign the measured time and occurrence of the monitored gameplay actions in this measured time period into pre-prepared form. The occurrence was measured on a nominal dichotomous level. The length of each interval was notified to the subject in advance verbally, but also shown on a non-temporal action before the actual measurement. Subject played the game and at the zero interval the researcher announced the beginning and the end of one minute. To eliminate the effect of sequence, the order of games in the experiment with each subject was rotated. It was ensured that there were no time pointers in the room. At the beginning of the experiment the game was started and the subject was acquainted with the principles of game controls and with the goal of the loaded game stage. First the means from all the time estimates were compared. Let us recall that the goal in the production method was to notify the minute of play-time. Thus if the measured value was higher than 60 seconds, then the subject „looses time“, because in the end they think that they spent less time playing than they actually did. The highest mean in time estimates was found within the Machinarium game, the lowest conversely within the Fallout game. Then the significant value of Factorial ANOVA test (significance level = 0,05) and the follow-up Bonfferons post-hoc test proved that the means are significantly different between the Machinarium and other two games. The difference in means between Mafia and Fallout isn’t statistically significant. Therefore the first hypothesis can’t be accepted, however, we’ll focus on the interpretation of this result in the discussion. To test the second hypothesis, the averages of the time estimates, in which the observed game actions occurred, were used. The following chart lists a clear comparison of these averages. However, these mere means have a big disadvantage. They don’t take into account the occurring interactions of two or more observed gameplay actions in one measuring interval. To differentiate these effects it would be necessary to analyze the estimates by multivariate linear regression analysis. As dependent variable the time estimate would enter into analysis (in seconds) and as explanatory variables would serve occurrence dichotomy of the observed gameplay actions. As dependent variable into analysis enter the time estimate (in seconds) and as a explanatory variables would be occurrence dichotomy of the observed games actions. To avoid the distortion of the regression coefficients by the „constant“ error of the individual subjects, identification variable of the individual subjects of the experiment enters into the more complex regression models. In other words, the alternative model put against the simple one takes into account deviations in estimates even in cases, when the subject estimates still significantly deviated from the one minute and thus differentiated him/her from the other subjects. For a better clarity the following tables contain only the preferred second model. The table doesn’t include the values of the coefficients for the individual subjects, because stand-alone they don’t provide any beneficial interpretation. The data fulfilled the requirements for using the regression analysis. For the Machinarium game the model explains almost half (48%) of all the variation in data (table n.2). 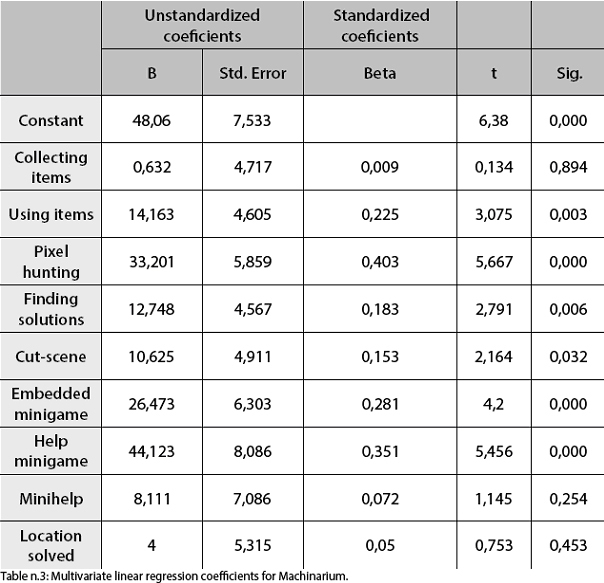 Based on the significant Beta coefficient (table n.3) we can say that to estimate the regression coefficient (in this case the rate of distortion, the collection of items, screen solving or minihelp) isn’t relevant. All other actions distort the subjective perception of time. The biggest effect has the pixel-hunting (standardized Beta coefficient = 0,40), help minigame (0,35), minigame (0,28) and the usage of items (0,23). By using the non-standardized Beta coefficients we can predict the value of the estimated time. For example in the case of the pixel-hunting the time estimates are constantly about 33 seconds higher. For the Mafia game the model explains 35% of variation in the estimates. The subjectivity is featured significantly in the model proposed. We can thus predict that certain subjective factors influence the estimates in this game. It can for example be “predisposition” to tension or arousal, which Mafia builds more intensively or the knowledge of controlling the 3D action shooters. For the Mafia game shooting and driving sequences (including car accidents) are significant actions. According to results obtained, other actions aren’t significant, nor are they associated with time perception bias. The last game analyzed is the Fallout 2. The significant predictors are turn-based fighting, inventory manipulation, leveling up and other actions with the interface. Seemingly the strongest effect have actions with the interface and fighting. Therefore we can accept the second hypothesis – in the above-listed game activities we were able to identify those, which in the statistically significant way influence the estimate of a play-time interval. Theories explaining subjective time perception are based on two main conceptions. Memory-based approach comes from Ornsteins “storage size” hypothesis (later from hypothesis of contextual change), which says, that we estimate time on the accumulation of the information in our memory (Macar, Grondin & Casini 1994; Block & Zakay 1997). In other words the more of the complex elements from a memory enter the cognitive process, the longer the interval seems to be. The second approach of the informational processes was based on Treismans (1963) concept of the internal clock “which included a pacemaker, a counter, and a comparator mechanism” (Block, Hancock & Zakay, 2010, p. 331). Based on this approach was created “attentional game model” (Zakay, 1995), which works as follows: If we focus on a primal action, that we mark as non-temporal, and simultaneously we focus on how the time passes, we do two things at a time, which need a certain level of our attention. The more attention and interest we give to the non-temporal activity (in our case playing a game), the less we get for the temporal activity (production of time intervals). In other words, attention given to non-temporal activity results in gate closing. The longer the gate is closed, the higher is the probability that the pulse from the inner clock won’t get to the cumulative counter. When we lose the impulses, it happens that the subject time passes slower than in reality, therefore the time loss phenomenon takes place (Macar et al., 1994, Zakay & Block, 1995, Block & Zakay, 1997, Block et al., 2010). This first model doesn’t theoretically justify the situations, where time passes slower for the subject than in reality. Hence numerous modifications were invented for this model, where in order to solve the problem, another important mental process was added – emotions that affect the speed and frequency of pulses done by the “pacemaker”. Angrilli et al. (1997) then collectively identifies three variables, which in the AGM logic model influence the time judgment. They are a) attention and the amount of processed information or cognitive load b) arousal c) emotional valence of the information. Generally speaking, the higher the cognitive load, the higher arousal and positive emotional valence of the information lead to a situation, where “time passes fast”. This is the situation leading to the “time loss” phenomenon. On the other hand, negative emotional valence with high arousal (for example fear, stress, angry) or less attention has opposite effect. So we can say that in the Machinarium game the players experience greater distortion of time than in the other two games (table n.1). Although the Machinarium is a real-time game, we can’t say that the player is pushed by the game’s time frame to a certain action. The goals aren’t timed and you can’t lose in the game. We can also say that besides the other games the Machinarium can be described as positive, humorous, artistic and logic adventure. Majority of players is therefore inclined to perceive this game without associations to negative valence, tension or stress. Cognitive load, which supports the “time loss” effect, is present in the game of solving the individual puzzles, combining items, searching the screen, minigames and pixel-hunting (table n.3). That helps to explain higher values in time perception bias measured for these situations. The Mafia game often requires higher cognitive load, because readiness, permanent interaction (except the non-interactive cut-scenes that proved insignificant) and familiarity with controlling the 3D games is necessary to successfully play the game. This is subconsciously learned through time and practice, but it requires coordination of both hands and also orientation in 3D game space (the enemy can be behind your back). We can also say that the Mafia, because of the impossibility to freely save the game, time limitation and car chases, the risk of death, its narrative and overall emotional valence of the story, produces a great arousal in players, sometimes associated with negative valence. We can account relatively low average time distortion of the subjective time while playing this game to the mutual annulment of both mental processes – cognitive load and negative arousal. With exception of shooting (see table n.4) which is evidently connected with higher amount of cognitive load. Slow car driving with an exceedingly difficult controls requires a higher cognitive load too and at the same time compared to the previous shooting sequence doesn’t causes too much tension, so there is higher time bias. A special interpretational case is the Fallout 2 game. It differs by simple controls, by the integration of complicated interface, turn-based fights and requirement to strategize by the player. The distortion of the subjective time is the lowest. As with Machinarium this game thanks to its turn-based mode doesn’t put any time pressure on the player. Even if it’s possible in some cases to predict the presence of arousal, this effect is mitigated by the possibility to save the game at any time, although it shares Mafia’s negative valence. In combat, which is associated with time-frame change, or activities associated with the complex interface (leveling up, other actions with interface and inventory), so with those which require tactics and familiarization with controls of game elements, time went by quicker for the subjects (table n.5). According to the AGM theory, we should also find an opposite effect on the estimated time with the time frame disturbances, which are associated with the loss of tension (loading a mission or losing in the Mafia, save/load game and dialogs in the Fallout 2, cut-scenes). Such an assumption, however, didn’t prove to be valid. These activities are associated with a progress of the player in the story, possibly with a progress in the development of the game (Hitchens, 2006). It’s possible, that the influence in progress time frame would likewise show up in retrospective paradigm based on “memory based” approach in a way that the estimate would be distorted by the number of the story twists and progresses stored in memory. Under the prospective paradigm we can say that the progress in games story doesn’t distort the subjective time. It’s also necessary to reflect on some flaws of the method used, that lead us to misinterpretation of the results. Tobin, Bisson & Grondin (2010) claims that players get “into” the game after 12 minutes. Although the individual game sequences of the experiment lasted mostly around 15-20minutes, it would be better if the experiment would contain larger sections of the game. On the contrary, it became clear that some actions (e.g. shooting or fighting) occurred so often that it would be better to choose a shorter period than one minute for time estimates. The alternative solution would be to record not only if an action occurred or not, but the number of these actions in a time period. However, method used to measure subjective time proved to be applicable. Subjects didn’t show instances, where they couldn’t carry out non-temporal and temporal actions simultaneously. It can be assumed that transitions between real-time and turn-based interactions, lower levels of stress, more complex controls and a greater number of gaming activities associated with cognitive load are tied to the higher probability of “loss of time”. With the story progress and non-gaming sequences under prospective paradigm and informational-based approach we didn’t prove any influence on the distortion of time. Based on the theoretical balance it is likely that progress in the game is more affected by retrospective estimates about the play time, not the judgment about time flow that we make in the process of playing. This is especially more influenced by those gaming actions, which according to their design, employ our minds in various degrees. There are logical problems associated with finding objects and actions leading to further progress, additional mini-game puzzles, activities that are difficult to control (whether through an interface or control of clumsy vehicles) or moments where you need to make decisions for further progress (deciding in which areas to improve the characteristics of the avatar, choosing weapons in your inventory, turn-based combat). It also became clear that those activities that are linked to higher cognitive activity, but also to certain situations in the game which produce increased negative or low positive arousal (fear, boredom), works against each other in terms of their effects and thus distortion of time was not significant (compare shooting in Mafia and combat in Fallout). So we can claim that game’s type and structure alone intervenes in the measurement, even though it is based on another study it isn’t possible to generalize all game characteristics influencing the perception of time. Hopefully my contribution to better understand this phenomenon have provided some guidance for future research in the progressive area of game studies. I would like to thank Tomáš Bártek, Jan Miškov and Jan Motal for their help and commentaries. Whether in the form of performing side quests, collecting items and special perks or simply in the form of overcoming the score. By this, we don’t mean that gaming is actually waste of time. We use it as a bias in time perception. In quantitative research questionnaire 82% of respondents (N = 280) confirmed, that during gameplay they experience time loss. At the same time there wasn‘t found any significant relationship between age, gender and the frequency of playing games. 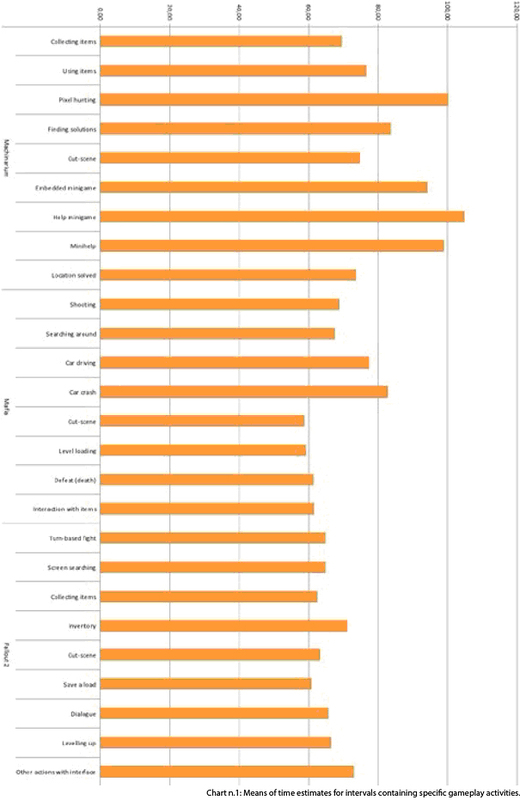 Respondents were asked about the characteristics of games, at which they experienced time loss mostly. By important elements were confirmed the complexity of games and immersion (38.9%), system of levels and tasks, interaction with other players and plot driven stories (Wood et al. 2007). In media science this finding is useful for a better insight into the character of the medium of a game compared to the media imposing passive reception of their content. It also allows us to indentify the game characteristics, which significantly affects perception. From the methodological standpoint is the usefulness in recommendation about consideration the game specifics and the diversity of gaming segments in the time perception research. In terms of psychology, this finding contributes to the gaming addiction research. Contributes to an understanding of what gaming activities and characteristics of the game attract the players attention the most and so they spend a significant amounts of time with some of these games (which subjectively passes quickly). The game state can be understood as a particular situation in a game. For example, when playing chess, with each turn, the game state changes (Juul 2004). We do not distinguish the game features and activities any further. Among the activities we classify main actions which a player can perform in the game environment (search around, shooting, driving a car), but we also monitored such actions, which de facto are not those of a player (non-interactive scene, loading the mission, menu…) – we name these game elements. This is a typical mechanism for the RPG genre. When you get a certain number of experience points (score for the actions performed in the game) then players are allowed to improve the skills and abilities of their avatar. Gaming activities operationalization was based on the pre-test, the research of Wood, Griffiths, Parke (2007) was also an inspiration. With the game Machinarium we designed the variables as follows: collect items into inventory, the successful use of objects (including the successful combination of inventory items), pixel-hunting (clicking around the screen to find objects), the search for a solution (“dialogues”, incorrect solution, wrong combination of objects), non-interactive cut-scene (including long animations), mini-game (setting an arm, setting a crane), helping mini-game (prompt-book), use of mini-help dialogue, solving the game screen. The Mafia’s variables were: shooting, scanning the surroundings (survey rooms, landscape), car (ride), car accidents, cut-scene, loading a mission (loading screen), losses, interaction with the environment (use first aid kits, opening doors and collecting subjects). In Fallout 2 it was: combat (turn-based mode), surveying the screen (looking around and exploring the world with the mouse cursor), collecting items, inventory (if open), cut-scene (shot on Vault 13 site), save and load, dialogs (dialog screen), leveling (open character screen), other work with the interface (use of skills, pip-boy, map). Real-time interaction, more complex controls and more complex interface requires more attention. Time pressure, a low rate of disturbances and negative valence increases arousal. Using the ANOVA test, we were verifying whether there are differences in the means of the time estimates due to sampling error (degree of freedom = 2, F = 11.45, sig. = 0.0001). Bonferrons post-hoc test subsquently determined between which games there are significant differences in means. The identification has been recoded for 11 dummy variables. This is the suitable theoretical frame only for interpretation of results. In our experiment we can’t distinguish exactly this three psychological processes (it would need heart rate sensor and other sophisticated monitoring techniques). There wasn’t any frustration (negative arousal) confirmed with the pixel-hunting, because there was a help system present, which doesn’t allowed the player to “get stuck” on one point in the game. This assumption is based on observation during the experiment (respondents often said that aiming is difficult and also they often repeat the first action sequence of the game). Selected shooting sequence is accompanied by dramatic music and aggressive shouting of hidden enemies. This can evoke fear and stress. Only three of eleven respondents are regular players of 3D action games. Obviously we can argue, that these three respondents couldn’t have shooting associated with high cognitive load (learned ability), but also they can be more resistant to negative arousal (resistant to fear from hidden enemies…). This assumption is based on observation too. Mafia plot takes place during the American Prohibition. The vehicles and their physical models correspond to this. Vehicles are slow, heavily maneuverable and very prone to destruction. Respondents reacts on car chase sequence in the context of fun (destructions – positive valence) or boredom (slow speed – low arousal). Aarseth, E. (1997). Cybertext: Reflections on Ergodic Literature. Baltimore: Johns HopkinsUniversity. Perception, & Psychophysics, 59 (6). Block, R., Hancock, A. P., Zakay, D. (2010). How cognitive load affects duration judgments: A meta-analytic review. Acta Psychologica, 134 (3). Block, R., Zakay, D. (1997). Prospective and retrospective duration judgments: A metaanalytic review. Psychonomic Bulletin & Review, 4 (2). CHI’04 Extended Abstracts on Human Factors in Computing Systems. New York, NY: ACM Press. Csíkszentmihályi, M. (2008). Flow: the psychology of optimal experience. New York: Harper Perennial. Hitchens, M. (2006). Time and computer games or “no, that’s not what happened”. In IE ‘06: Proceedings of the 3rd Australasian conference on Interactive entertainment. Australia: Murdoch University. Chou, T.J., Ting, C. C. (2003). The role of flow experience in cyber-game addiction. In CyberPsychology & Behavior, 6. James, W. (1952). The principles of psychology. Chicago: Encyclopaedia Britannica. Juul, J. (2004). Introduction to Game Time. In First Person: New Media as Story, Performance, and Game. Massachusetts: MIT Press. Gruber, R.P., Block R.A. (2005). Effects of caffeine on prospective duration judgements of various intervals depend on task difficulty. In Clinical and Experimental, 20 (4). Kirkpatrick, G. (2009). Controller, Hand, Screen: Aesthetic Form in the Computer Game. In Games and Culture, 4 (2). Lorraine, G. (1979). The perception of time. Perception & Psychophysics, 26 (5). Luthman, S. et al. (2009). The Effect of Computer Gaming on Subsequent Time Perception. Cyberpsychology: Journal of Psychosocial Research on Cyberspace, 3 (1). Macar, F., Grondin, S., Casini, L. (1994). Controlled attention sharing influences time estimation. Memory & cognition, 22 (6). Myers, D. (1992). Time, symbol transformation, and computer fames. Play Culture, 5.
game players. In CyberPsychology & Behavior, 9. Sanders, T., Cairns, P. (2010). Time perception, immersion and music in videogames. BCS HCI: Scotland. of Maryland School of Medicine. 14. Tobin, S., Bisson, N., Grondin, S. (2010). An Ecological Approach to Prospective and Retrospective Timing of Long Durations: A Study Involving Gamers. PLoS ONE, 5 (2). Tobin, S., Grondin, S. (2009). Video games and the perception of very long durations by adolescents. In Computers in Human Behavior, 25. Treisman, M. (1963). Temporal discrimination and the indifference interval: Implications for a model of the “internal clock”. Psychological Monographs: General and Applied, 77 (13). Wood, R., Griffiths, M. D., Parke, A. (2007). Experiences of Time Loss among Videogame Players: An Empirical Study. CyberPsychology & Behavior, 10 (1). Zakay, D., Block, R. (1995). An Attentional – Gate Model of Prospective Time Estimation. Zakay, D., Block, R. (1997). Temporal Cognition. Current Directions in Psychological Science, 6 (1). Illusion Softworks. (2002). Mafia. Illusion Softworks. Dvorský J. (2009). Machinarium. Amanita Design. Black Isle Studios. (1998). Fallout 2. Interplay. Mgr. et Mgr. Jiří Grummich is a student of Interactive media, Sociology and Environmental Studies at Masaryk University. He is interested mainly in game studies, media and market research. The study was originally published in Media res – journal for media research (1/2013). We thank the editors for permission to re-publication.